Austria-Hungary before World War I was an empire, the largest political entity in mainland Europe. It spanned almost 700,000 square kilometres and occupied much of central Europe: from the mountainous Tyrol region north of Italy to the fertile plains of Ukraine, to the Transylvanian mountains of eastern Europe. 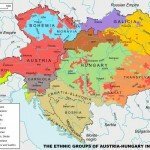 Eleven major ethno-language groups were scattered across the empire: Germans, Hungarians, Polish, Czech, Ukrainian, Slovak, Slovene, Croatians, Serbs, Italians and Romanians. 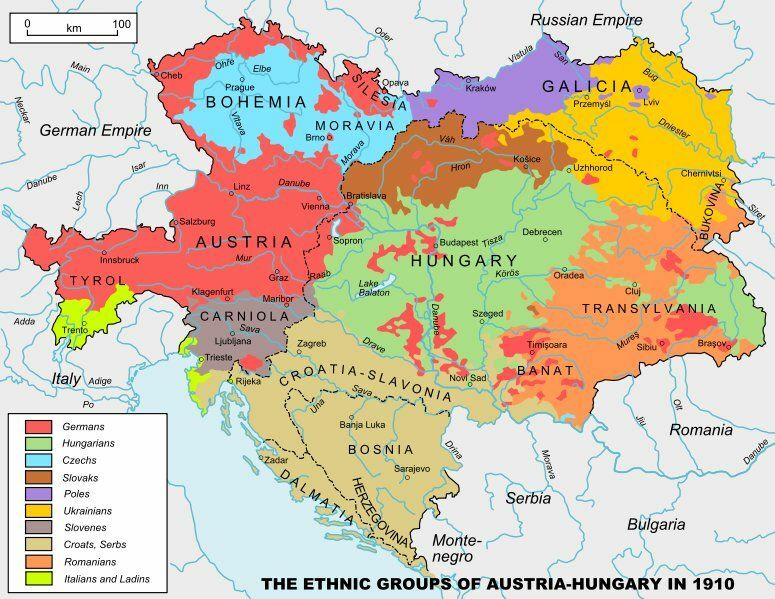 Like Germany, the Austro-Hungarian empire was a new state comprised old peoples and cultures; it was formed in 1867 by a compromise agreement between Vienna and Budapest. The empire’s political organisation was complex and unusual, in large part because of its origins as two separate kingdoms (it was often called the Dual Monarchy for this reason). 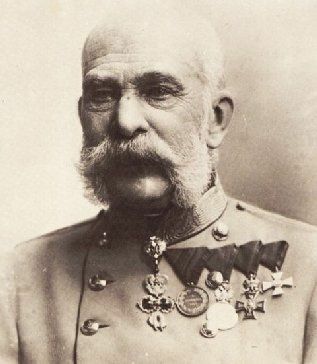 Franz Josef was its sovereign and emperor, though he was first crowned as king both of Austria and Hungary. Each of the empire’s two monarchies continued to exist in their own right; they had their own parliament, prime ministers, cabinet and a degree of domestic self-government. As one might expect in a political union of this kind, there were grievances, dissatisfactions and frequent disagreements. The empire as a whole was overseen by a central government, responsible for matters of foreign policy, military command and joint finance. This imperial government was comprised of the emperor, both prime ministers, three appointed ministers, members of the aristocracy and representatives of the military. 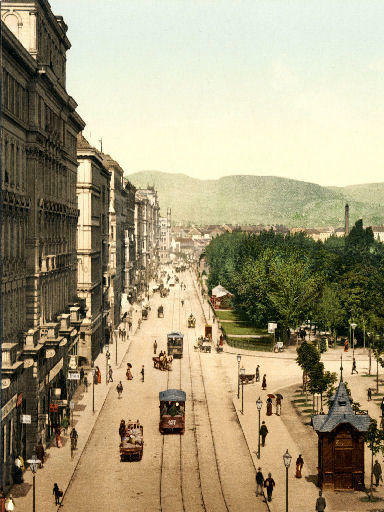 Economically, the 19th century had been beneficial for Austro-Hungary. The empire shed its final feudal remnants and began developing and expanding capitalist institutions, such as banking, industry and manufacturing. The National Austro-Hungarian Bank was formed, supplying credit and investment funds, as well as forming a vital financial link between the two halves of the empire. Manufacturing and industrial production increased rapidly in the western half of the empire, while the east remained its agricultural heart, producing most of the Dual Monarchy’s food. Austro-Hungarian annual growth was the second-fastest in Europe, behind that of Germany. The imperial government invested heavily in railway infrastructure, chiefly because of its military benefits; by 1900 the empire had one of Europe’s best rail networks. Industrial growth and modernisation led to improvements in trade, employment and living standards. The Dual Monarchy’s military force was essentially comprised of three armies: those which still belonged to the kingdoms of Austria and Hungary, along with a newly created force called the Imperial and Royal Army. There was a considerable division between the three. The two older armies were protected by their respective parliaments, receiving more funding and better equipment and training. The imperial army was perpetually short of qualified officers, and three-quarters of those it had were Austrian. This created its own problems since Austrian officers spoke German but the majority of soldiers were Hungarians, Czechs, Slovaks and others. To combat this language gap, enlisted soldiers were taught a set of 68 single-word commands; this allowed the Imperial and Royal Army to function, though with considerable communication problems. Most soldiers were conscripts, which did not help morale. Despite these difficulties, the Austro-Hungarian imperial army was as professional as could reasonably be expected. Its high command and its officers drew on Prussian military methods, and most regiments were comparatively well-equipped with modern small arms, machine-guns and artillery. 1. The Austro-Hungarian Empire was a dual monarchy, formed by a merger of the two older states in 1867. 2. Though Austrians were dominant, the empire housed many different ethnic and language groups. 3. Like Germany, went through a significant period of industrial growth and modernisation in the late 1800s. 4. 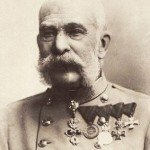 Its government, led by Emperor Franz Josef, was autocratic and dominated by aristocrats and militarists. 5. Austria-Hungary had a powerful modernised army, though its effectiveness was undermined by internal political and ethnic divisions, such as language barriers between officers and their men. 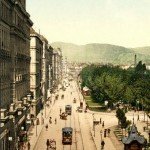 J. Llewellyn et al, “Austria-Hungary before World War I” at Alpha History, https://alphahistory.com/worldwar1/austria-hungary/, 2014, accessed [date of last access].